The flexible choice for lifting your business. Our reachstackers for industrial handling are designed to improve the efficiency and safety of any lifting task. The innovative boom design with excellent rotation and the wide range of attachment options mean Kalmar machines can be adapted for a huge variety of applications, including steel handling, wind-turbine construction and other demanding heavy-lifting tasks. For example, our in-depth understanding of the complex logistics in the rapidly growing wind energy industry has helped us deliver equipment tailored for lifting hubs, blades, towers and nacelles. The most extensively tested machines in the world are made by Kalmar. In all kinds of material handling demands we combine experience with innovation and a reputation for reliability and quality. Transporting hubs, blades, towers and nacelles is challenging. Our reachstackers are a reliable and flexible tool for a wide range of operations within the wind power sector, and can be fitted with our specialist attachment that makes lifting safe and easy. Long shifts, heavy loads and high accessibility demands mean steel handling solutions must be robust and versatile. 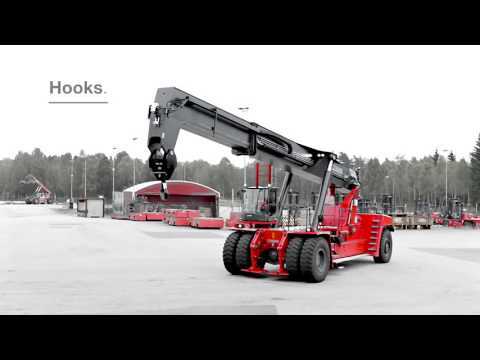 Our reachstackers can all be customised to handle steel, is why so many businesses in the sector choose Kalmar.